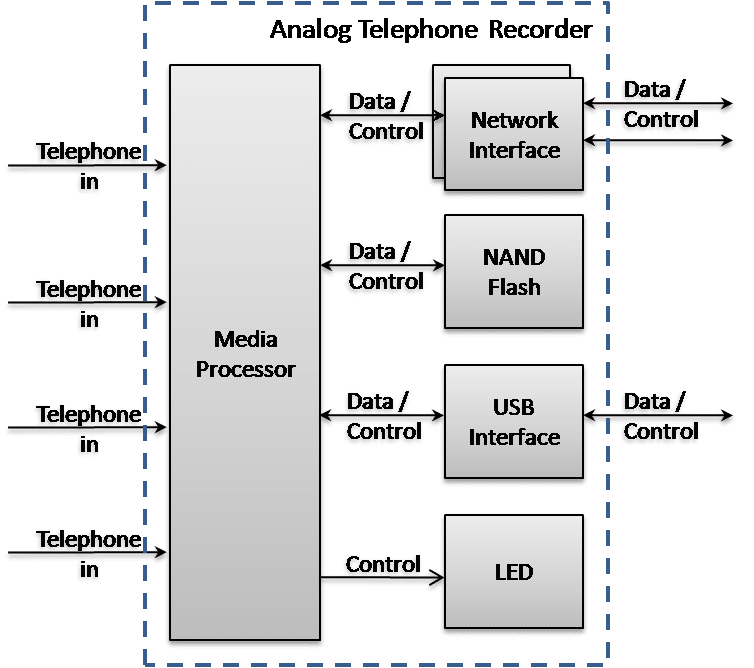 VOCAL’s Analog Telephone Recorder reference design provides real-time multi-channel call intercept and recording for business, lawful interception and other applications. With over 25 years of custom design and development experience in the telecommunications industry, VOCAL has the expertise and extensive customization support to develop the quality product features and performance you want. VOCAL’s Analog Telephone Recorder solution provides both the hardware design and complete optimized software for a fully integrated and robust telephone recording product which can be brought to market quickly. Custom call recording solutions are also available. VOCAL’s Analog Telephone recorder supports both 8kHz and 16kHz sample rates and 8bit or 16bit file recording in either linear PCM or PCM A-law or μ-law formats for up to 4 phone line taps. Each line recorder provides voice, fax and data distinction and automatically pauses recording during prolonged periods of silence for optimal resource utilization. Files can be recorded to flash memory and auto archived to external USB storage as well as uploaded to a network server. A human readable log file captures line events, recording sessions and types of recording, including fax and voice calls for each telephone line tap. If specified, event notifications are emailed. Recording parameters are configurable using the web interface and include parameters such as sample rate, file format and destination media, start and stop times, auto archiving, and event notifications. The user can also set thresholds for deleting files after a certain time or when storage remaining reaches a specified value. VOCAL’s analog telephone recorder reference design is based on the ADI Blackfin processor. Contact us for supported platforms and performance information for your analog voice and fax recording used in lawful interception and business applications.